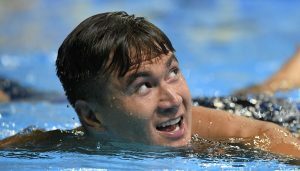 Bremerton’s Nathan Adrian was selected by his Olympic peers on Tuesday as one of six captains to head Team USA as they prepare for the Rio Games in a matter of weeks. 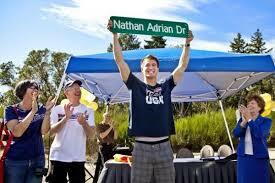 Adrian was selected as a captain along with Michael Phelps and Anthony Ervin for the men’s team. On the women’s side, captains are Cammile Adams, Elizabeth Beisel and Allison Schmitt. The team is training in San Antonio this week before heading to Atlanta for more training and then to Brazil. Adrian is not the first Bremerton swimmer to be named a team captain. That honor goes to Tara Kirk Sell who was named for the women’s team for the 2004 Athens Games. Bremerton’s Tara Kirk Sell, and her sister Dana Kirk Martin, paved the way for swimmers to dream big. The sisters were the first to make a U.S. Olympic swim team when they competed at the 2004 Athens Games. Tara won a silver medal as a member of the 4×100 medley relay. She now lives in Baltimore with her husband and two young children, and wrote this op-ed piece for the Baltimore Sun. Kirk Sell, a public health researcher and associate at the UPMC Center for Health Security in Baltimore, gives a great insightful voice on the public health concerns of Zika from the Olympians point of view. There has been talk from some in the public health sector to cancel the Rio Olympics due to Zika. Swimswam.com caught up with Nathan Adrian after his race in the 100-freestyle on Thursday at the Mesa Grand Prix in Arizona. And… here’s the post-race video from Friday’s 50 free. Nathan talks about his upcoming schedule, which includes the Mare Nostrum series, which Olympic silver medalist and fellow Bremertonian Tara Kirk Sell swam, and the Santa Clara Invite in August. According to a three-year long study by the Griffith Institute for Educational Research in Australia, swim kids are smarter kids. The study, which surveyed parents of 7,000 five-year-olds and younger in Australia, New Zealand and the United States, shows the swimming children reach developmental stages faster than other children. As well as achieving physical milestones faster, children also scored significantly better in visual-motor skills such as cutting paper, colouring in and drawing lines and shapes, and many mathematically-related tasks. Their oral expression was also better as well as in the general areas of literacy and numeracy. 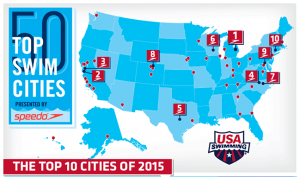 Here’s the story link on the USA Swimming website by Mike Gustafson. From what I’ve seen during the last 13 years covering swimming in Kitsap, I tend to believe the study. All of our elite-level swimmers, Tara Kirk Sell, Dana Kirk, Nathan Adrian, Emily Silver and their siblings all excelled in high school and as undergrads and graduate students. Currently Tara is getting her doctorate in public health from Johns Hopkins. Coincidence? Ummm, maybe. But I think the fact that so many of our swimmers started at a very young age helped in their development, both socially, physically and mentally. Besides, is there anything cuter than a 1-2 year old in the water? I think not. Palo Alto Stanford Aquatics-DKS coach Dana Kirk is hosting her second Women in Coaching Clinic at the Far Western Championships, Friday-Saturday, at Stanford University. Kirk, a 2004 Olympian from Bremerton, will be joined by her sister, fellow 2004 Olympian and silver medalist Tara Kirk Sell. Kirk Sell will be speaking on how high school swimmers can make the transition from high school to college, and then college to becoming a professional swimmer. Also headlining the clinic will be Rachel Stratton-Mills, one of only three female coaches to be have an athlete on the U.S. Olympic team in 2012, as well as the only female coach to have a swimmer on the U.S. National team and the U.S. National Youth team. Former PASA coach Stephanie Fryberg, Dr. Susan Wood (former lacrosse coach) and Glenn Mills of goswim.tv will also be speaking at the clinic. You can see a video of Dana talking about the clinic here.